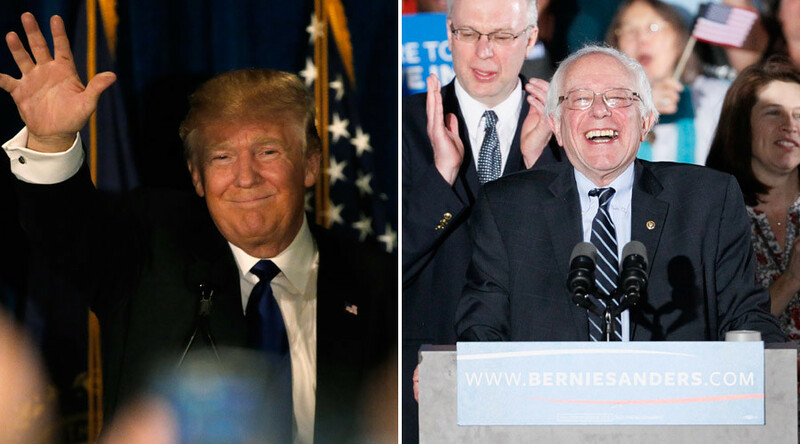 Billionaire Donald Trump and Senator Bernie Sanders easily swept to victory in the New Hampshire primaries, buoyed by voters clamoring for change in American politics and politicians not backed by Wall Street contributors. Trump and Sanders entered New Hampshire as the favorites in their respective party races, the Republican and Democratic primaries. Trump appealed to conservative voters looking for a political outsider, while Sanders led with a strong following among young voters keen for a change in government as usual. With more than 75 percent of Republican precincts reporting, Trump had captured 34.5 percent of the vote, with John Kasich at 16.3 percent, Ted Cruz capturing 11.5 percent, and Jeb Bush with 11.2 percent. For the Democrats, Sanders had won 59.7 percent of the vote and Hillary Clinton claimed 38.6 percent, with more than 75 percent of the precincts reporting. “Together we have sent the message that will echo from Wall Street to Washington, from Maine to California. And that is that the government of our great country belongs to all of the people and not just a handful of wealth campaign contributors and their super PACS,” Sanders said at his victory rally. Clinton addressed her supporters alongside former President Bill Clinton and their daughter Chelsea. She congratulated Sanders and acknowledged that she has “some work to do” to generate support. Sanders beat Clinton by 36 points among those who earn less than $50,000 a year. Back on the GOP side, Ohio Governor John Kasich surprised many by finishing in second place. Kasich emerged from a pack of candidates that included Jeb Bush, Texas Senator Ted Cruz, who won the Iowa Caucus, and Florida Senator Marco Rubio. Kasich’s campaign manager told AP he expects an increased flow of contributions following the strong showing.